Fashion of a Novice: What shoes to wear with a wedding dress? What shoes to wear with a wedding dress? We all know, that shoes for a woman mean a lot and she can even fall in love with shoes she saw in the store and will do anything to get them. Shoes make up a woman’s entire style, they are its complement and most important part, something without what you cannot imagine a female look. 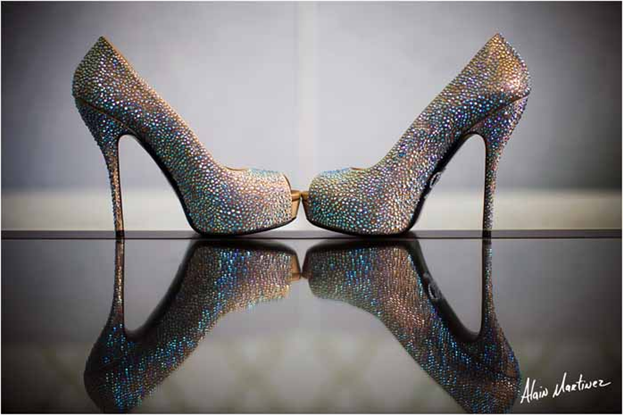 All these features are actual especially when it comes to wedding shoes. 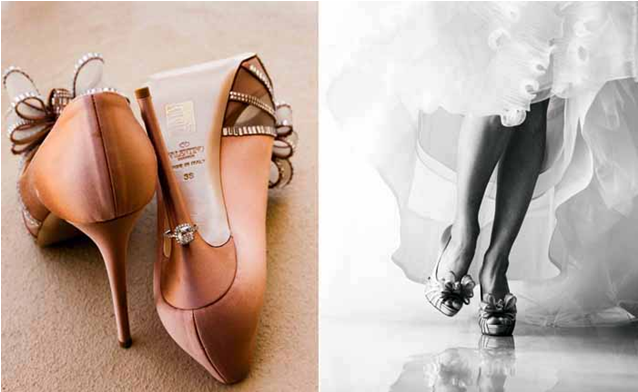 Every bride knows, she should be more than just careful when choosing her pumps for her wedding. So, what kind of shoes you are better to choose for your wedding dress, so it all would coincide and look truly gorgeous and you could have your amazing beach wedding pictures? Let’s consider several types of shoes, so you could look through all possible variants for you. If you want to have something unusual; on your feet, then designer’s shoes with clove flower with shaped embellishment will be what you really seek for. They look very classical, trendy, fashionable and at the same time, very simple. Such shoes will fit great to dresses of free-flowing tissue like chiffon, georgette or batiste, with folds or just plain ones. Are you mad about rhinestones and crystals or some glittering brooches? If yes, then you really have to consider an option of getting a pair of some stoned shoes, with such pretty things on them. Be sure, they will look amazing hen combined with a tea-length wedding dress. If you are the woman preferring chic, elegance and yet simplicity rather than flashy and too fashionable shoe design, then pretty plain but yet, very lovely closed-toe pumps with light comfortable heels are the best option for you. Besides, simplistic shoes forms like this one can also help you make your shoes safekeeping. If you feel confident enough to spend your wedding day in pencil high heels, then such kind of open-toe stilettos with some band or bow accents, go with dresses both short and long. If the ribbons are satin-textured, they can also add a gentle touch of brightness and color kind of to any dress. Again, if you are fan of shoes with pleats and layers, then choose something like this for your wedding gown. If you really want to apply this sophisticated style to your dress, you can surely opt for pumps with shorter heels in order to make the whole image be vintage. Another sample of comfortable wedding shoes are pumps with wedge heels. If you find kitten heels, really lovely, in them you will be going really smoothly as if sailing on the wedding aisle, with no worry at all. If you prefer comfort first of all rather than walking on a heel, then these ones will surely become the perfect choice for you. One more comfortable alternative for you will be flat ballerinas shoes, made of lace and with a sling back on them. If your dress is made of lace, you may probably not wish to wear lacy shoes, and instead of that go in for pointed tip shoes with a low heel. In this case, even flat shoes having a slightly pointed tip will make you look great. This is by The Breakers Palm Beach. Ahh I love weddings and I love shoes. Thanks for sharing this awesome post. Have a great day, dear.